Stila has released a series of Travel Palettes, each containing four powder eyeshadows and a Convertible Color. The Road to Radiance Across the USA palette was the first in the series. Four palettes have been released to date, and the final palette, Fabulous in Fiji is due out in mid-November. You can view the whole series on the Stila website. 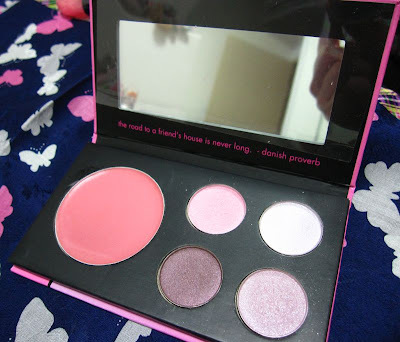 The palette is touted as having a retail value of US$65 but costs only US$10. The fine print is that these palettes are made in China, unlike most of Stila's line which is usually made in the good old USA. I find the retail value claim to be unsettling as there's no way anyone would pay US$65 for such a palette in the first place. But for US$10, it is actually quite a decent palette. Personally, I have a soft spot for the Stila girl illustrations so I wanted to pick up the whole set of the Travel Palettes if only just for the palette cases. 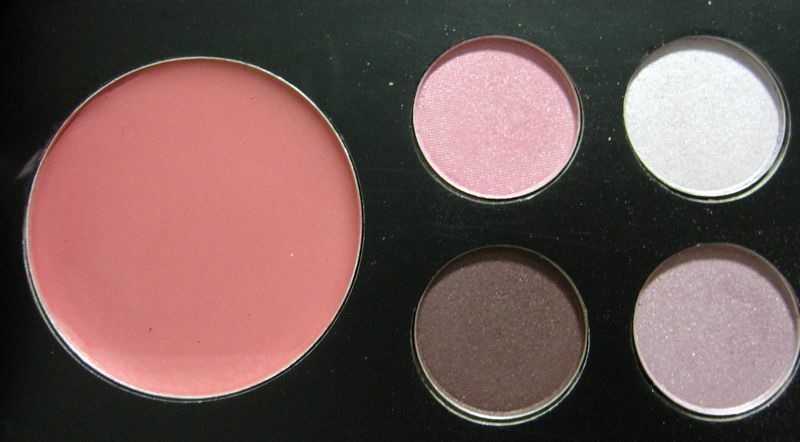 The four eyeshadows have a soft shimmery finish. There aren't any annoying obvious glitter bits. The glimmer has a lovely illuminating effect without being too loud. I applied these over my usual T'estimo Eye Bright Up Base so I didn't have any problems getting the eyeshadows to show up easily. The quality and texture is certainly not the rich and intensely pigmented shades of classic Stila shades like Diamond Lil and Kitten, but I still found them easy to work with. 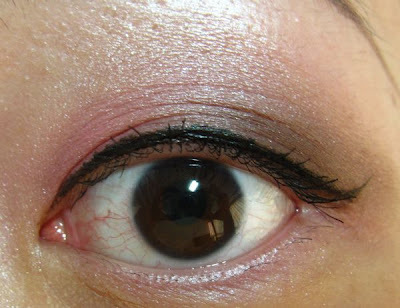 I applied Snow Bunny over the browbone area and the inner corners, Valley Girl in the crease, Southern Belle along the lower lashline and from the inner corners to the middle of the upper lid, and City Chick from the middle of the lid to the outer corners. Then I finished with Heroine Make Smooth Liquid Liner along the upper lashline and Shiseido Nourishing Mascara Base topped with Clinique High Impact Mascara. 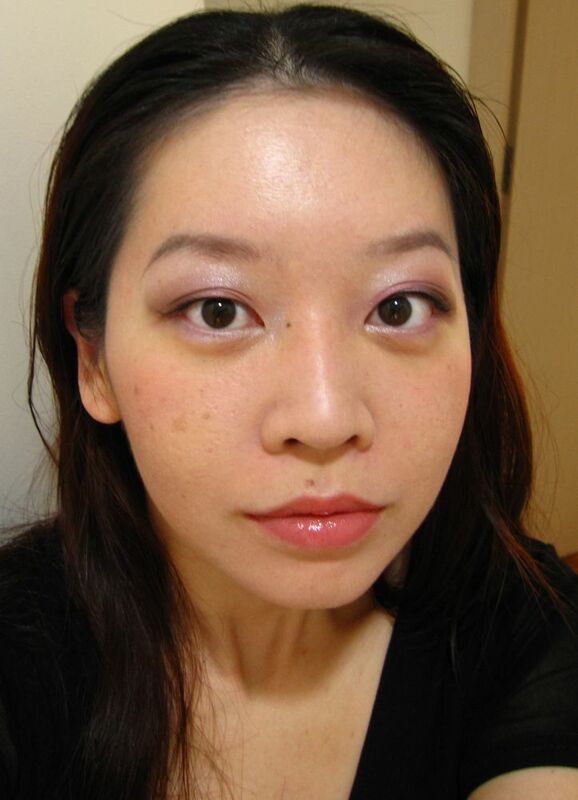 The other products I used today were: Dior X4 Control Compact Foundation 012, Shiseido Refining Makeup Primer, K-Palette Real Lasting Eyebrow 01, Jill Stuart Loose Powder #1 Natural, Anna Sui Spot Concealer 01, Tarina Tarantino Dollskin Cheek in Parasol and Za Plumper Lips #2 Rosy Flush. 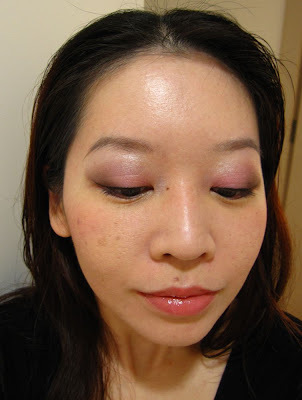 Right now, I'm trying to use up my Dior X4 which is why it appears in many of my FOTD posts. The Za Plumper Lips #2 Rosy Flush is a pretty peachy pink with a lovely shine and glossy finish. The Plumper Lips glide on with an emollient finish and last about 3-4 hours on my lips (with light drinking). If you press your lips together, you can feel the micro sparkle bits but these didn't feel uncomfortable or rough to me. Hi did you buy stila from the web? US$10? that's a good buy! I got the palette CP'd from the US. Didn't know it's out in the stores! Shiseido had told us that it would be available in October. I like the wet texture of these as they suit my perpetually dry lips, and they just glide on so smoothly. It's a pity that there isn't a wider variety of shades as most are light pinks. Hi Haru, do you know if we still have stila counters in sg? i seldom see them anymore, wondering if they have already pulled out of our country? There's still a Stila counter at the Escentials boutique in Tangs Orchard, beside the Shu Uemura counter. The range is quite limited though and they don't have the Travel Palettes. 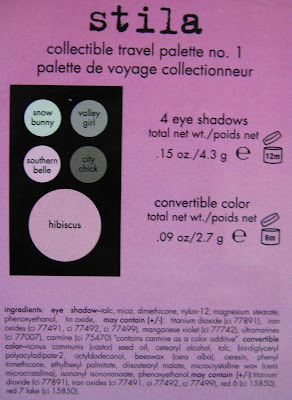 Any idea if the Travel Palettes will still be available in the US early next year? Btw can I check with u cos I'm boy sure. If I have a moisturizer with spf25 pa++ is it still a must I still need a sunblock? And if I hv a make up primer is it after my sunblock and follow by my bb cream or liquid foundation and that's all? Rly need ur help! Thanks! The Travel Palettes are available only while stocks last, so it's hard to say if they will still be available in the US next year. If you really want them, best to get a friend in the US to help you purchase or perhaps ship through VPost (if you are in Singapore). if your moisturiser already contains SPF25, then you don't need a separate sunblock BUT you have to ensure that you are putting on sufficient moisturiser to provide adequate sun protection. It may say SPF25, but if you apply too thin a layer, then you may not be getting SPF25 worth of sun protection. 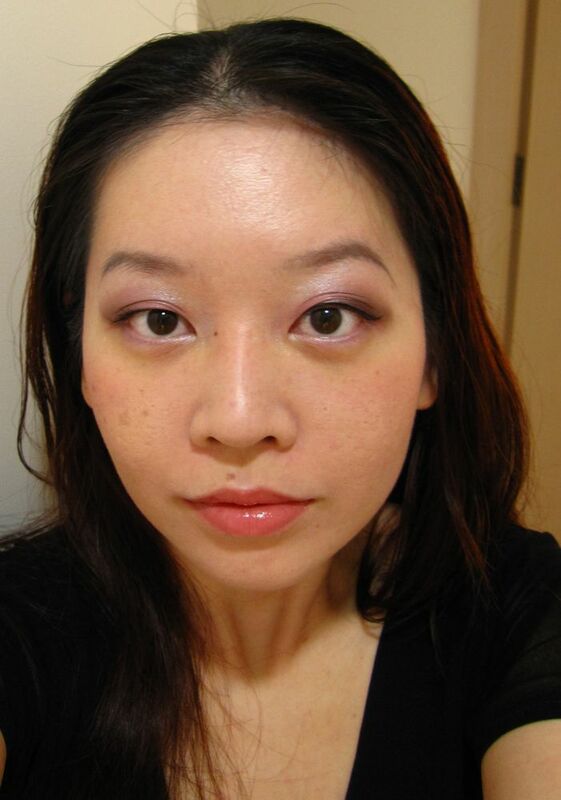 As for the order in which to apply the products, I would say sunblock, followed by primer and then foundation. If possible, why not find a primer that has at least SPF15, so that you do not have to layer so many products? A moisturiser can also work like a primer in terms of prepping the skin for foundation. I've gotten road to radiance and pretty in Paris from Sephora.com. The latest one, Moscow, looks really work-friendly, love the soft blue in it! Thanks for this info. I think that I may try ordering this. Nice pucker lip, i love your rosy pink and can't agree more it looks really lovely. spotted a cool sparkling "Tarina Tarantino Dollskin Cheek in Parasol", where can we get this baby? also i try to figure out a tube in this FOTD but your camera flash it out and i can't make out what's that tube , it is next to Anna sui eye concealer. is it your favorite testimo eye primer or something? hope you can help me with this, for Jill Stuart Loose powder you are using 1, Natural. i checked the swap for 2 Lucent but both seems the same and do you know what's the difference actually? and the site is also in japanese which i don't understand really. for their 3rd one is Shimmer, that one i make out is normal LP with shimmer that's all? think so. thanks so much in advance, Haru! really love to buy one but it doesn't come cheap so hope you can help thanks! I haven't tested the Lucent shade before so I'm not sure how it compares to Natural. 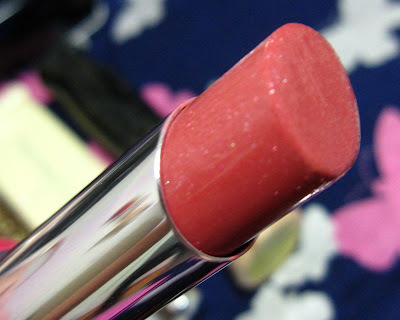 My guess is the Natural is slightly more beige-toned than Lucent, and that both Natural and Lucent do not contain shimmer particles whereas #3 Shimmer does. The Tarina Tarantino makeup line is exclusive to Sephora in the US, I think. I purchased it in New York. The yellow tube next to the Anna Sui concealer is the Testimo Eye Bright Up Base. Testimo has been discontinued.